IBM POWER Roadmap... 7+ now late and only an almost 3 years projection for 8? 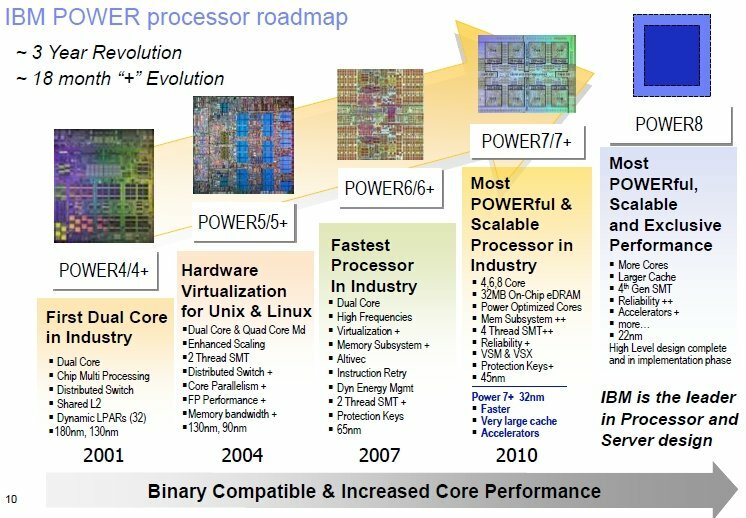 IBM POWER Roadmap... 7+ now late and only an almost 3 year projection for 8? An image speaks a thousand words, late today with a blue box for a future, just before the Oracle SPARC T4 release? Sketchy details on something possibly 3 years out??? No commitment beyond (almost) 3 years for POWER??? POWER has been quite interesting, for being cobbled together via multi-chip modules. Certainly a less risky approach, but a more expensive approach which does not offer flexibility of mass-production. Of course, there was never a delusion in the standard POWER family of trying to "make it big" - those days are long gone, with the former IBM partnership with Apple and Motorola. It is nice to see embedded POWER in some video game machines and cell phones, but we have not seen a commodity desktop chip in a long time. With multiple vendors developing SPARC, where anyone can develop SPARC processors, without resriction - IT executives and government organizations may feel more comfortable with another type of roadmap. It would be nice if IBM the confidence in POWER that Oracle has in SPARC, who released a 5 year roadmap, where Oracle has been providing continual public updates as SPARC benchmarks have been met. The new SPARC T processors have been on-time for every generational launch for the past 5 years, with Solaris Update 10 already leaked and T4 processors about to be released. With the decision to invest in a processor based upon a single piece of silicon, the ability to mass-produce at lower cost created low-cost options for SPARC in the past, at a time when few companies were trying to produce low-cost, embedded and commodity processors. With SPARC, we have not seen a commodity desktop workstation for the education and scientific markets in awhile, either. After the Ultra 45 Workstation and migration of the SunRay UltraThin Clients from MicroSPARC IIe, that was the last of a worthy line of systems. The market is hoping to see something from another OEM vendor, since one might suspect Oracle is not terribly interested in anything other than servers, and there always seems to be an OEM vendor releasing a SPARC compatible portable or deskop. The upcoming T4 is a terrific candidate. There are multiple vendors who design and have been encouraged to design SPARC, from the United States, to the U.K., to Africa, to Europe, to Russia, to China, and to Japan. The SPARC application market is best when there are multiple governments, educational facilities, companies, and startups who are competing to produce a better (or, at least, available) design. Markets with competition and open designs have always been better for the industry as well as the customers. There is a reason why Solaris is trusted in the telecommunications arena and has nearly 2x the number of applications than combined AIX and HPUX. The following has been added to the Solaris Tab for Networking information. The following are technical articles related to Network Management in the past half-month. Attack code dubbed “Apache Killer” that exploits the vulnerability in the way Apache handles HTTP-based range requests was published Friday on the Full-disclosure mailing list. By sending servers running versions 1.3 and 2 of Apache multiple GET requests containing overlapping byte ranges, an attacker can consume all memory on a target system. The denial-of-service attack works by abusing the routine web clients use to download only certain parts, or byte ranges, of an HTTP document from an Apache server. By stacking an HTTP header with multiple ranges, an attacker can easily cause a system to malfunction. The radio spectrum owned by Dish, and LightSquared, is reserved for satellites, but as satellite transmissions have a hard time penetrating buildings and terrain operators are allowed to build an Ancillary Terrestrial Component* – infill transmitters operating at the same frequency as the birds and providing signal to those without line of sight. LightSquared turned that model on its head, suggesting that the ground-based network would be primary, with the satellite providing in-fill: estimated at around 2 per cent of traffic. LightSquared then successfully lobbied the FCC to permit it (and its wholesale customers) to ship equipment that isn't even capable of satellite communications, turning the company into a 4G network wholesaler without having to shell out for 4G spectrum. an Internet worm dubbed “Morto” spreading via the Windows Remote Desktop Protocol (RDP). F-Secure is reporting that the worm is behind a spike in traffic on Port 3389/TCP. Once it’s entered a network, the worm starts scanning for machines that have RDP enabled. Vulnerable machines get Morto copied to their local drives as a DLL, a.dll, which creates other files detailed in the F-Secure post. SANS, which noticed heavy growth in RDP scan traffic over the weekend, says the spike in traffic is a “key indicator” of a growing number of infected hosts. Both Windows servers and workstations are vulnerable. Heroku – the multi-language "platform cloud" owned by Saleforce.com – is now running Java applications. Akin to Google App Engine, Microsoft Azure, or VMware's Cloud Foundry, Heroku is an online service for building, deploying, and readily scaling applications. It was originally designed for Ruby on Rails apps, but has since expanded to Clojure, Node.js, and now Java. Apple is planning to phase out unique device identifiers from iOS 5, according to documentation sent out to developers, possibly to stop people worrying about their privacy on iPhones and iPads... they should "create a unique identifier specific to your app". [Wall Stree Journal] Henschel also pointed to the recent spat between the notoriously secretive Apple and analytics firm Flurry as a possible spur for the move. In January, Flurry reported that it had identified around 50 tablet devices in testing at Apple's campus in Cupertino using its analytics. "Some company called Flurry had data on devices that we were using on our campus – new devices," Jobs said live at the D8 conference in New York. "They were getting this info by getting developers to put software in their apps that sent info back to this company! So we went through the roof. It's violating our privacy policies..."
Nokia is expected to unveil the a major refresh of its Symbian OS today, bringing it bang up to date with competitive phones from two years ago. Owners of more recent Symbian^3 models should be able to update their handsets eventually. Four new devices are expected to be unveiled – either today, or very shortly. The Belle update should keep loyalists happy for some time to come. Performance and usability appear to have been improved greatly. You can buy as much premium support as you like (although some question how well it works). Premium performance streams? Not so much. On Wednesday, the virtualization giant introduced Micro Cloud Foundry, a free downloadable version of its Cloud Foundry service that runs on a single laptop. This past spring, when VMware unveiled Cloud Foundry and open sourced the code behind it, the company indicated it would eventually offer a shrunken incarnation that would allow developers to test applications on their local machines. Cloud: VMware turns self into (virtual) database co.
vFabric Data Director has a utility pricing model, as you would expect, at a cost of $600 per VM under management per year that is running a database image. vFabric Postgres, VMware's tweaked and tuned version of PostgreSQL, is available free of charge for developers and will be available for download starting today at cloudfoundry.com. If you put a vFabric Postgres image into production, then it costs $1,700 per VM per year. The underlying vFabric 5.0 Standard Edition costs $1,200 per VM per year, while the Advanced Edition, which has more bells and whistles, costs $1,800 per VM. The Advanced Edition includes RabbitMQ messaging and an SQL interface for GemFire called SQLFire. At the VMworld virtualization and cloud extravaganza in Las Vegas today, Dell said that it was fluffing up the Dell Cloud using VMware's brand-spanking-new ESXi 5.0 hypervisor, the vSphere 5.0 management tools for it, the vCloud Director cloud fabric, and the vCloud Connector extensions that allow a private cloud and a slice of a public cloud to be managed from the same console and to teleport jobs back and forth from the public and private clouds. The Dell Cloud comes out of the Dell Services unit, which is the amalgam of Dell's server and PC support business and consulting services practice with the Perot Systems system and application outsourcing business it acquired in September 2009 for $3.9bn. Samsung may be mulling over the purchase of webOS – recently orphaned by HP – in a move to protect itself from an increasingly unfriendly Apple and the threat of Google and its new toy, Motorola Mobility. Or so say "sources from notebook players", speaking with the Taiwanese rumor-and-news website, DigiTimes. VMware envisions a world where applications can roam across one big intercloud. Apps won't just jump from internal data centers to public cloud services, the company believes. They'll move from cloud to cloud like phone calls across cell networks. That's why VMware is keen on getting its vSphere server virtualization not only in the corporate data center, but out there on the service providers who want to be the next Amazon EC2. Then VMware can own the corporate cloud computing on both sides of the firewall. After taking control of the CloudStack cloud management framework through its acquisition of Cloud.com back in July, Citrix Systems is now open sourcing the code behind the tool. At the same time, it's adding support for the provisioning of workloads on additional hypervisors and, for the first time, on bare-metal machines. Cloud.com was founded in 2008 at about the same time as rival Eucalyptus Systems. It was known as VMOps before it came out of stealth mode in May 2010. Citrix is trotting out CloudStack 2.2.10, which has been certified to support rival VMware's ESXi 5.0 hypervisor, part of the vSphere 5.0 server virtualization stack that was annoumced in July and which started shipping last week. Citrix is trotting out CloudStack 2.2.10, which has been certified to support rival VMware's ESXi 5.0 hypervisor, part of the vSphere 5.0 server virtualization stack that was announced in July and which started shipping last week. Officially, the world ran out of IPv4 addresses earlier this year, when a final batch of addresses was divided among the five Regional Internet Registries. There are still a lot of unused and underused IP addresses in the hands of various private organizations. All that is needed is an incentive for them to part with their unused addresses voluntarily. In other words, what's needed is a market in IP addresses. Earlier this year, Microsoft paid $7.5 million for two-thirds of a million IP addresses that were previously held by a bankrupt Nortel, suggesting that the going rate for an IP address is around $10. Ford, Merck, Xerox, Halliburton, and nearly a dozen other companies not primarily in the networking business were each given a Class A block of 16 million addresses. MIT also got a Class A block, and the UK government got two of them. The US government claimed about a dozen Class A blocks, giving it control of nearly 200 million addresses—more IP addresses than all of Latin America has today. Mobile: Sprint to get seat at grown-up table when iPhone 5 hits? Sprint will be the next carrier to offer the iPhone to customers in the US, according to sources speaking to the Wall Street Journal. The carrier will begin offering the iPhone 5 in October alongside AT&T and Verizon, both of which are also expected to begin selling the device mid-month, though it is believed that Sprint will also carry the iPhone 4, bolstering earlier rumors that Apple would keep around the iPhone 4 as the new low-cost replacement for the iPhone 3GS. The transition from IP Version 6 from IP Version 4 may be a slow moving target. With companies like Microsoft buying large blocks and other companies holding millions - IP Addresses are like gold and oil. These investments may prove to not only be profitable, but the sale of these virtual goods may slow the implementation of IP V6. Cloud Computing, based upon Virtualization technology from VMWare and Citrix open-sourced Xen continues to try to make inroads. Large system vendors like HP and Dell align themselves with proprietary VMWare. Oracle's VM technology maintains some level of compatibility with Citrix Xen. With Cloud Computing, the network becomes vastly more important. Microsoft Windows has another WORM exposure, around it's proprietary RDP technology, based partially around file transfer options while UNIX Apache finds itself vulnerable to denial-of-service attacks. These key infrastructure points underpin modern intranet and internet computing today, both putting pressure on "the network". The Apache DoS merely makes it "look like" a network problem while another Microsoft worm really creates a possible capacity issue with "the network", if it can't be controlled. The mobile market has the opportunity to heat up, with more mobile 4G vendors hitting the market. By diversifying 4G to include Satellite vendors, in conjunction with Cell Phone operators, as well as land-line operators, in addition to new WiMax vendors (i.e. Clear) - there is the opportunity for a real explosion in the mobile network arena... which will all need to be managed. With dominant smart phone vendors like Apple possibly releasing iPhone for Sprint - this could really grow their market, as ATT and Verizon raise their costs to customers. Oracle's Solaris and SPARC public road map is pretty clear - Solaris 10 Update 10 release is expected 2H 2011 with Solaris 10 Update 11 scheduled for 2H 2012. In a little more than 1 month away, Oracle OpenWorld 2011 is scheduled (October 2-6, 2011) to occur, which means significant announcements! The Solaris patch id's for Solaris 10 Update 10 (and beyond) have been updated on Oracle's Solaris Patch Corner blog. It seems Update 10 is named 8/11 (or August 2011), which means it is scheduled to be released around now and is the talk of the town. Last year, some features were known to be rolled into Solaris 10 Update 10. The SPARC T4 processor support is expected shortly. Some additional features to Solaris 10 Update 10 were leaked the following month. ...good additions besides the bug fixes. There might also be an update to the bundled samba which is a bit overdue. There appears to be a ZFS refresh bundled into Oracle Solaris 10 Update 10.
the LSI SSS 6200 Solid State Storage. A list of the patches comprising Solaris 10 Update 10 hit the internet. 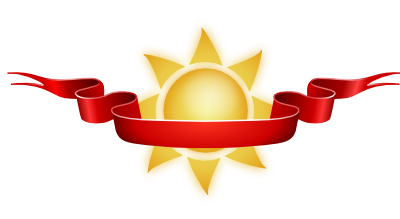 New features for the Linker may be added to Solaris 10 Update 10. The -z rescan-now, -z recan-start, and -z rescan-end options provide additional flexibility in specifying archive libraries to a link-edit. See Position of an Archive on the Command Line. It seems Oracle mistakenly released Solaris 10 Update 10 early to their Downloads section. Friday (2011/08/12) I went to the Solaris Download page and Update 10 was available for download. Today I go back to the page and it has reverted back to Update 9. Anybody know what's up? Has Update 10 been released or not? FWIW - What I'm hearing from my sources is that the ISO that was available IS the Update 10 that will be released. It will be officially released when the documentation is complete. If you are an EMC PowerPath user, Solaris 10 Update 10 should NOT be installed, until EMC 5.3 patch release has been made available. Please see NOTE 9 in the patch README. are incompatible with this patch. as they are subject to change. Failure to abide by this patch release note is not pleasant. Ken Thompson, creator of Unix speaks with Dr. Dobbs on a wide variety of topics. 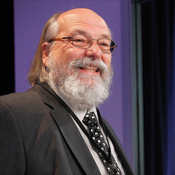 The Japan Prize, one of the highest honors awarded for outstanding contribution to science and technology, was awarded jointly this year to Ken Thompson and Dennis Ritchie for the creation of Unix. The prize is normally given to the recipients at a lavish banquet in Tokyo attended by the emperor. However, due to the April earthquake and tsunami, the prizes this year were distributed at the honorees' place of work. Ken Thompson's ceremony was held at Google headquarters, where he currently works, and afterward he spoke with Dr. Dobb's editor in chief Andrew Binstock on a wide variety of topics. Their discussion ranged from the development of Unix, beginning in the late 1960s, to the collaboration with Ritchie, to Thompson's current project, the open source programming language Go, which is designed to get the most performance out of today's multicore and networked computers. Some technical news of interest to Network Management professionals. iPads are the only tablet devices that several large brokers expressed an interest in, as vendors seek alternatives routes to peddle their wares. "There is a mountain of surplus tablets in the channel," said one, "and they are just not shifting"... resellers continue to try and clear massive stocks of notebooks caused by the biting slowdown in consumer demand. Apple is expecting to shift 56 million iPhones of one type or another during the last six months of 2011. Taiwan-based supply chain moles say Apple has upped its production requirement from the 50m units it ordered at the end of Q2, DigiTimes reports. Google has made its largest-ever acquisition, and biggest corporate gamble, by splashing out $12.5bn for Motorola's phone division, Motorola Mobility. The deal puts Google into the hardware business in a serious way – and into direct competition with licensees of its Android operating system, who woke up this morning thinking they were Google's business partners. Mozilla isn't officially breaking the seal on Firefox 6 until tomorrow, but the code for the latest iteration of its popular open source browser is already available online. It is currently tucked away on the organisation's FTP server. A blogger over at TechnoBolt spotted that the code has been downloadable since at least Saturday 13 August. With the strong sales of newer portable form factors such as the new Apple iPad and iPhone, the trend to move away from traditional desktop computing, and even luggable laptops continues to accelerate. This trend continues to place pressure on wireless infrastructure, which needs to be properly managed. With Google Android and Microsoft Windows based devices in decline, in the tablet market - GPL'ed Linux and proprietary Windows are both taking a beating by mixed Open Sourced BSD UNIX based iOS (MacOSX) [with proprietary hooks] based devices. Both of these operating systems are pushing hard [and more successfully] in the mobile arena, in the handset arena. The movement by Google to buy Motorola may be a move to help stem the tide, by injecting more money into the vertical phone & tablet chain, which seems to be faultering under the weight of warehouse backlogs. The JAVA suit by Oracle is probably not helping, since Motorola has to pay license fees for all non-Google based handsets, while Google handsets have been able to undercut non-Google handset costs by refusing to pay Oracle license fees. As mobile computing becomes more pervasive, network management will continue to be challenging.